Does Spending Big In The Transfer Window Work? Football clubs in the English Premier League have found this month's transfer window an expensive experience. 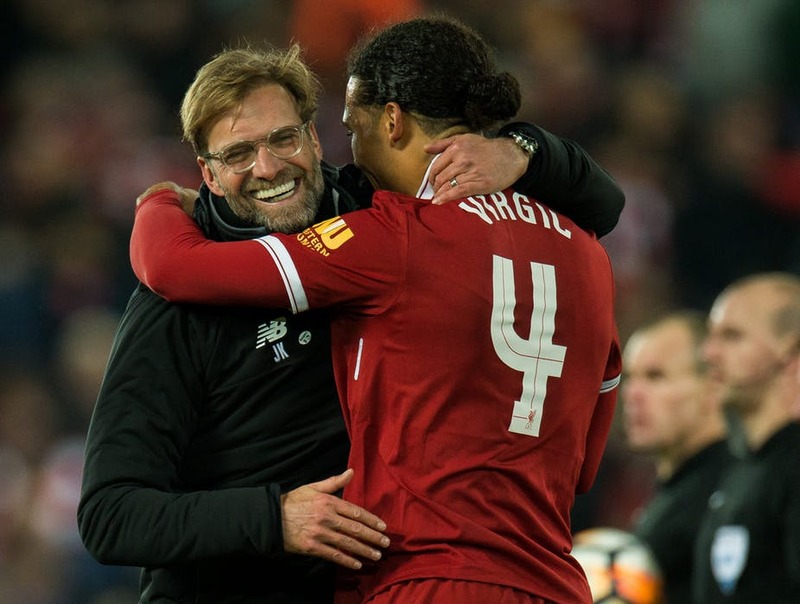 With Liverpool breaking the world record for a defender with the signing of Virgil van Dijk and the sale of Phillipe Coutinho to Barcelona, for a fee rising to £142m - bargains are in short supply. So is it worth spending the money? Many clubs are finding it a challenge to weigh up their options ahead of the transfer window slamming shut at the end of the month. Should they back their manager and spend? Can they afford it? And, with so much riding on a Premier League place, should they stick with the players they've got or twist and buy more? Here we make sense of the data from recent seasons to work out what can be done and what could work. New Manager, Players Or Both? The clubs at the bottom of the league have already been busy trying to change their fortunes. West Ham United, Crystal Palace and West Bromwich Albion all made a managerial change before the window opened. Two, Palace and West Ham have seen an upturn in results, climbing out of the relegation zone. Swansea City also decided a change was necessary over the Christmas period, and Stoke City has parted company with manager Mark Hughes following a slump in form which saw them drop into the bottom three and exit the FA Cup at the hands of Coventry City, three leagues below them. With recent research suggesting that changing a manager mid-season is worth an average improvement of three league positions (assuming the change is made early enough for them to have an impact), it's hardly surprising to see these gains in action. 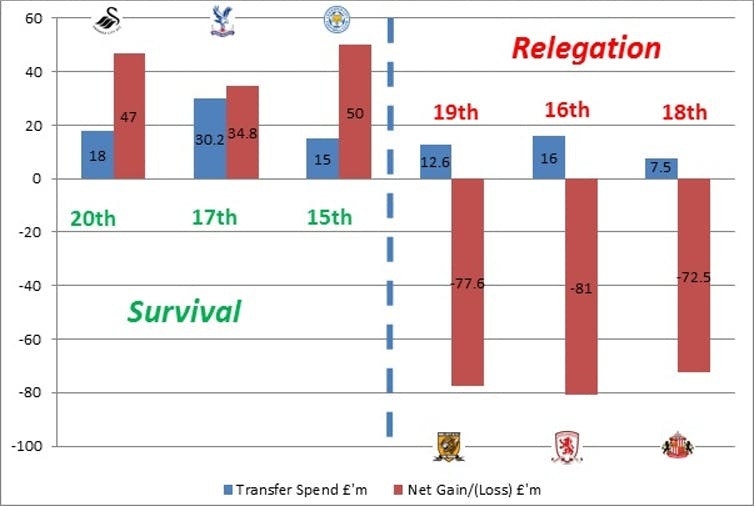 Three positions could be the difference between survival and relegation (which can make or break a club's financial stability). Or a lucrative place in a European competition. Perhaps this was the thinking behind Watford's surprise sacking of coach Marco Silva. His departure was the eighth of the season in the Premier League - that's 40 percent of managers already losing their job. With this in mind, it is easy to see why clubs are keen to put a new manager in place at the start of the transfer window. Based on current standings, any club in the bottom half can realistically be considered in danger ,and those who haven't yet shown their hand (such as Newcastle, Bournemouth and Southampton) are left playing playing Russian roulette. So let us consider who could change their fortunes and see whether past windows can help clubs make that illusive, right decision. Ironically, Swansea City find themselves in exactly the same position as they were on New Year's Day 2017 - bottom of the table. Two days later, they appointed a new manager and spent £18m on new transfers. These two decisions helped them to a 15th-place finish and league safety (a gain of five places) - a position that equated to £9.7m extra revenue for the club. Even more importantly, by avoiding relegation they retained about £60m in TV money. With this in mind, £18m on transfers looks like a bargain. Similarly, Crystal Palace spent £30m in the January 2017 window after appointing Sam Allardyce as their new manager shortly beforehand. He led them from 17th position to 14th by the end of the season. That said, it is not so easy as spending money to survive. Sunderland and Middlesbrough spent around £24m between them in January 2017 and still got relegated, but then neither club changed its manager in sufficient time for it to take effect. Sunderland themselves gambled a year earlier, spending £25m in the winter window of 2016 and stayed up. But the club couldn't repeat this trick with David Moyes at the helm last season. Yet, crunching the numbers doesn't show any real pattern. For some clubs spending works, and for others it doesn't. 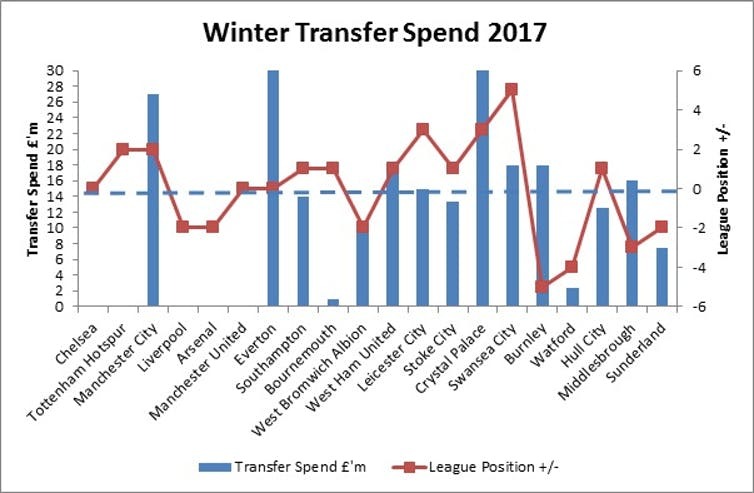 What is clear is that, more often than not, increased spending in the transfer window coincides with a new manager at the helm, suggesting that sometimes a shake up of more than one element of the club is needed. Plus, many fans will argue, it is better to do something rather than nothing and just accepting your fate. With Manchester City seemingly a shoe-in for the the league title, we have paid little attention to the top of the league. They remain fairly active, however, at this time of year. There has been a lot of discussion over the future of Manchester United's manager and the club's need to spend in the winter window - not to have any bearing on this year's title race, but to bed-in new players early enough to hit the ground running next season. This seems a logical approach. A new manager often takes time to embed their methods and to develop a squad they deem appropriate to win football matches in their style. After all, Pep Guardiola guided City to third in his first season in charge, before spending £221.5m in the summer window in 2017. Now they are 12 points clear at the top of the table. The winter window throws many clubs into a tailspin, with fans and commentators piling on the pressure to spend. There is no perfect formula, though, and clubs need to consider their options carefully. It's not a simple case of spending big and hoping for the best and, while we predict another record breaking window, there seems a greater need to make decisions that are planned strategically to maximize their return. Knee-jerk purchases should be kept to a minimum, just like that outfit that is reduced by 70% but will never be worn. Rob Wilson is a Principal Lecturer in Sport Finance at Sheffield Hallam University. Dan Plumley is a Senior Lecturer in Sport Business Management at Sheffield Hallam University. This article was originally published on The Conversation. I appreciate the writer trying to analytically answer the question, but it's rife with limitations. First, the statistic of "teams who change managers move three spots higher on average" is misleading. Most of the time, these teams are already 18th -20th. If you are already 19th, you can move to 22nd. The downside is relatively low. A better ratio might be points/games played. Second, the sample size is too small to make any meaningful conclusion. I think they realize that, but if we really want to know we'd track this for years. Third, it's unclear to me if the spending figure they are using is "net spend" or "gross spend." For instance, a team might pay Player 1 30m, but they also might sell a lesser player or two for 2m each, send a few players on loan (and earn a fee), etc. So the net spend overall is a bunch lower. As a fan, it's just cheaper to fire the manager. Part of it is strategic. To attract players, players want to play on teams that play an expansive, offensive style. Over the past few years, even though teams like Crystal Palace, West Ham, West Bromich Albion, and Stoke City were not exactly known for that, they hired managers to put that sort of system in to improve the team, and consequently, increase the chances of a sustained run in the Premier League. When that is failing, you hire the new manager to turn more defensive. So you might hear the terms "hoof-ball," "park the bus," etc. An easy analogy would be replacing your football coach with a conservative, run/defense coach like Lovie Smith or John Fox. A few low teams refuse to compromise. That is why I love Bournemouth. Though tactically they will at times play more conservatively, they do not make it their centerpiece. Huddersfield is much the same way. So for them, they need to trust each other and continue to recruit second-level players aged 19 to 22 and develop them into Premier League-level players.